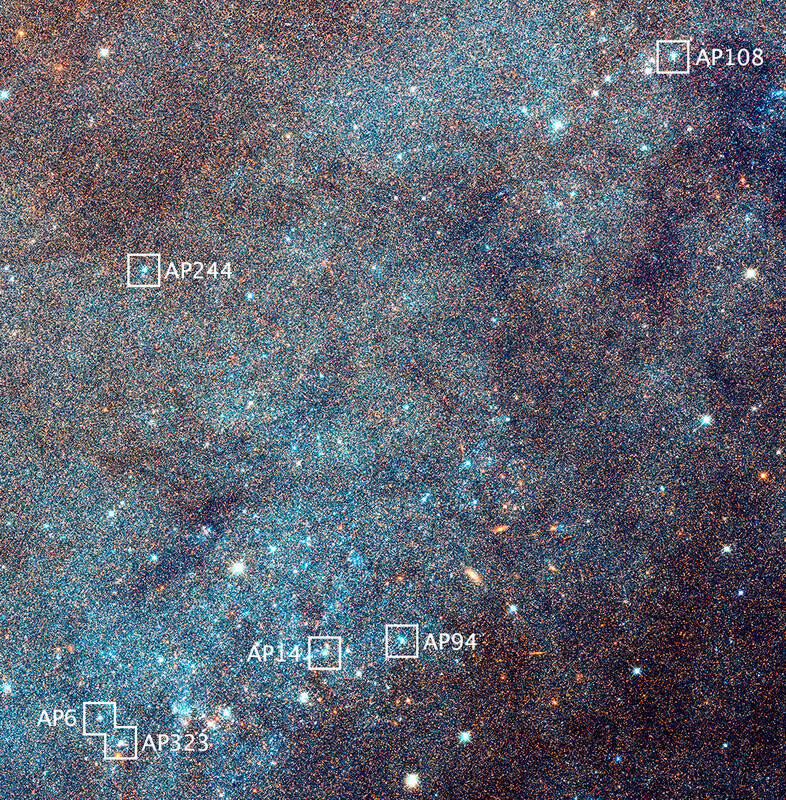 An enlargement of the boxed field in the image above reveals myriad stars and numerous open star clusters as bright blue knots. Hubble’s bird’s-eye view of M31 allowed astronomers to conduct a larger-than-ever sampling of star clusters that are all at the same distance from Earth — 2.5 million light-years. The view is 4,400 light-years across. The six labelled star clusters are shown in greater detail below. Image credit: NASA, ESA, J. Dalcanton, B.F. Williams, and L.C. Johnson (University of Washington), the PHAT team, and R. Gendler. 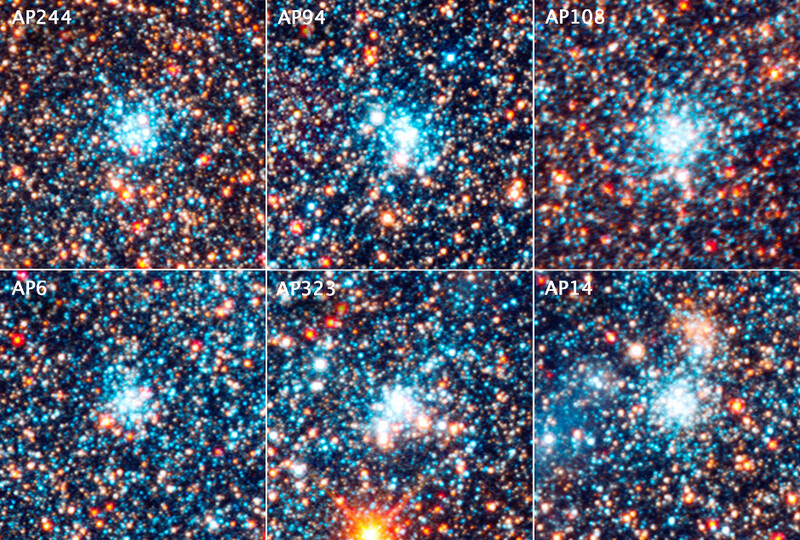 This is a view of six bright blue clusters extracted from the field above. Hubble astronomers discovered that, for whatever reason, nature apparently cooks up stars with a consistent distribution from massive stars to small stars (blue supergiants to red dwarfs). This remains a constant across the galaxy, despite the fact that the clusters vary in mass by a factor of 10 and range in age from 4 million to 24 million years old. Each cluster square is 150 light-years across. Image credit: NASA, ESA, J. Dalcanton, B.F. Williams, and L.C. Johnson (University of Washington), the PHAT team, and R. Gendler. This evidence also implies that the early universe did not have as many heavy elements for making planets, because there would be fewer supernovae from massive stars to manufacture heavy elements for planet building. It is critical to know the star-formation rate in the early universe — about 10 billion years ago — because that was the time when most of the universe’s stars formed. The Andromeda Project is one of the many citizen science efforts hosted by the Zooniverse organization. Over the course of 25 days, the citizen-scientist volunteers submitted 1.82 million individual image classifications (based on how concentrated the stars were, their shapes, and how well the stars stood out from the background), which roughly represents 24 months of constant human attention. Scientists used these classifications to identify a sample of 2,753 star clusters, increasing the number of known clusters by a factor of six in the PHAT survey region. “The efforts of these citizen scientists open the door to a variety of new and interesting scientific investigations, including this new measurement of the IMF,” Weisz said.